Odaiba Coastal Park with Rainbow Bridge; Green islands are No. 3 Daiba (center) and No. 6 Daiba (left back). We do not notice it much in our daily life, but Tokyo is a coastal city. Land reclamation started as early as the end of the 16th century, when Tokugawa Ieyasu (1543-1616) (*)reclaimed Hibiya inlet and connected Ginza peninsula with the mainland when he started to construct Edo as his power center. In the modern time the shallow water adjacent to the coast line of Tokyo was reclaimed to gain land for various industrial facilities. At the same time a sizable amount of water area was used for garbage disposal and the sea water was heavily polluted due to undisciplined industrialization. Tokyo coastal area reflected the ugly side of urban activities and was not a destination for leisure or sight-seeing. Tokugawa Ieyasu was the founder of Tokugawa Shogunate which lasted more than 260 years (1603-1867). After Meiji Restoration Edo was renamed to Tokyo. Things started to change around 1990. Sanbanze, the last natural coast line in the northern Chiba prefecture, narrowly escaped from reclamation because of the protest by environment-aware citizens. 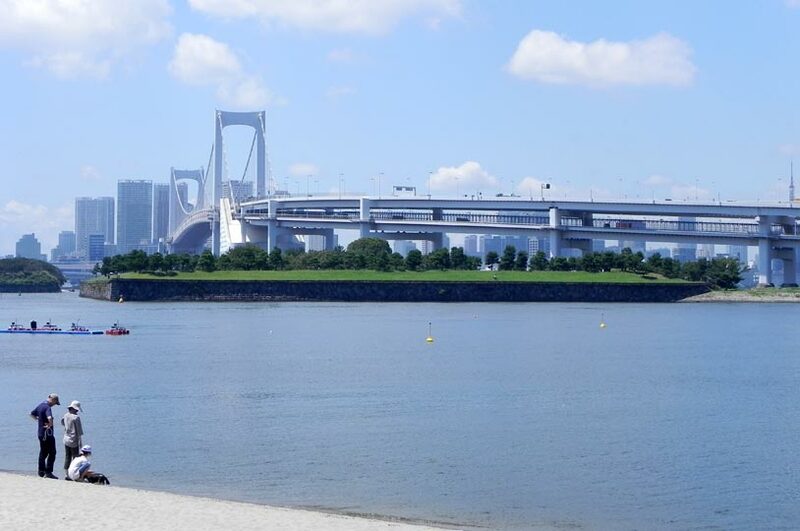 Tokyo Bay water gradually recovered its quality thanks to the efforts to reduce emission and other environment friendly measures since the 1970s. In the meantime the project to construct a oceanfront sub city-center started. In 1993 Rainbow Bridge opened and the visit of the island area became easier. Tokyo Bay area gradually became destinations for the people who wanted to find novel attractions. At the time, the development project drew public attention, because Aoshima Yukio (1932-2006), Governor Candidate at the 1995 election, promised in his election campaign the cancellation of "World City Expo Tokyo '96" which was to be held using the empty plot of the project area. Aoshima was elected a govenor and the World Expo was cancelled. I thought that the official development program for the coastal area was given up. But, that was a misunderstanding. Though the development was slowed down due to the sluggish economy after the end of "bubble economy", construction continued and new facilities opened one after another even after 1995. 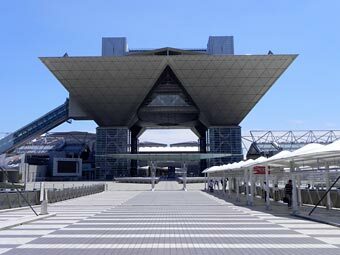 Openings of Odaiba Marine Park in 1996, Tokyo Big Sight in 1996 and Fuji TV in 1997 marked the birth of attractive "Tokyo Waterfront City". Nowadays people usually call the area simply "Odaiba", though exactly speaking Odaiba is the place name of a part of the area. 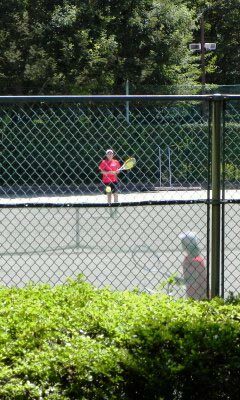 Ariake Tennis Forest Park opened in 1983 and provides wonderful thick greenery in the middle of bleak artificial landscape. Odaiba is the respect form of "daiba" (battery). After the first visit of Commodore Perry with his black gunboats in 1853, Shogun government constructed in haste several fortresses along the coast of Edo and placed there batteries to defend Edo in case Perry would come again. Though the military significance of the batteries was questionable, Perry anyhow stopped his ships in Yokohama when he came to Japan in the following year. Now only two fortresses are preserved. 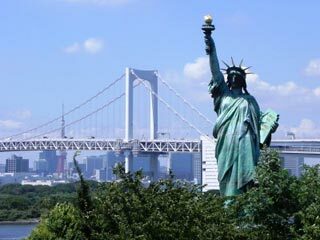 When "French Year in Japan" was held in 1998, the French Statute of Liberty was brought to Japan and placed here between April 1998 and May 1999 as a special attraction. When the display of the statue proved to be a huge success, a replica was made under the permission of the French government and erected in 2000. There are many popular buildings and facilities including one public thermal bath - onsen - in Odaiba area and they attract both Japanese and foreign tourists. Odaiba is popular also among Japanese young people. It is often reported that the present young people are not much interested in going out of their daily living area. They usually stay within their very narrow local living sphere, say small bed-towns near Tokyo, and seldom undertake "travel" out of their towns. Even those young people make up their mind from time to time to "travel" to Odaiba or Tokyo Disneyland. 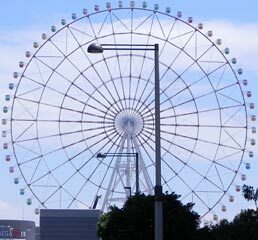 Though Odaiba is attractive as amusement place, it is coupled with the industrial infrastructure. A very busy highway goes through the area and connects Haneda and Narita airports and they are crowded with huge trucks and trorries.